Mary lived for 20 years as an anchoress near her uncle Abraham‘s cell. He had taken care of his brother's daughter after his death and brought her to live near him so he might care for her. In a moment of weakness she was seduced by a monk who had turned from his vows. Mary thought herself beyond forgiveness and in her shame she fled, giving herself over to wild, wild living. 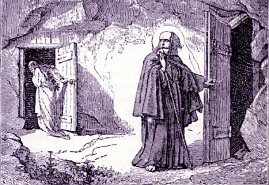 Abraham only left his hermit‘s cell twice, the second time to visit Mary disguised as a soldier. Mary picked him up, took him home and over supper, Abraham convinced her of the error of her ways. She converted and returned to the life of an anchoress, spending the rest of her days in prayer. Mary, patron against sexual temptation.